Üretici		:	Canadian Northern Steamship Co.
Royal Edward, Bristol Kanada arasýnda yolcu taþýmakta kullanýlan bir liner tipi büyük yolcu gemisi olarak yapýldý ve bu amaçla kullanýldý. I.Dünya Savaþý çýktýktan sonra asker taþýmakta kullanýldý. Komutaný Cdr. P.M.Wotton 'da son seferinde Çanakkale'ye 2. Batalyon piyadelerini taþýmakla görevlendirilmiþti. 13 Aðustos 1915'de Lt. Von. Heimburg komutasýndaki Alman Denizaltýsý UB-14 tarafýndan Kos adasý yakýnlarýndaki, Kandeliusa adasýnýn 6 mil batýsýnda tespit edildi ve torpillenerek batýrýldý. Torpil tam pupasýndan vurarak geminin çok hýzlý batmasýna sebep oldu. Kaptan da dahil olmak üzere 1000'e yakýn asker gemiyle beraber sualtýnda ki ebedi yerlerini aldý. 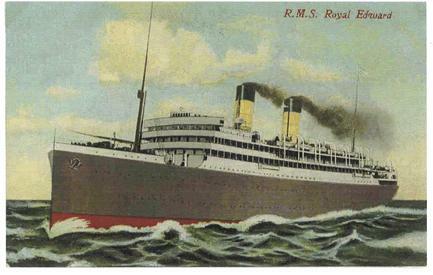 Bu gemi hakkýnda þu isimle yazýlmýþ bir kitap mevcut: "FASTEST TO CANADA.THE ROYAL EDWARD : FROM GOVAN TO GALLIPOLI." We have received from the Rev. Basil K. Bond, Chaplain to the Forces, who is attached to the hospital ship Devanha, an account of one of the most impressive funeral services of the war. 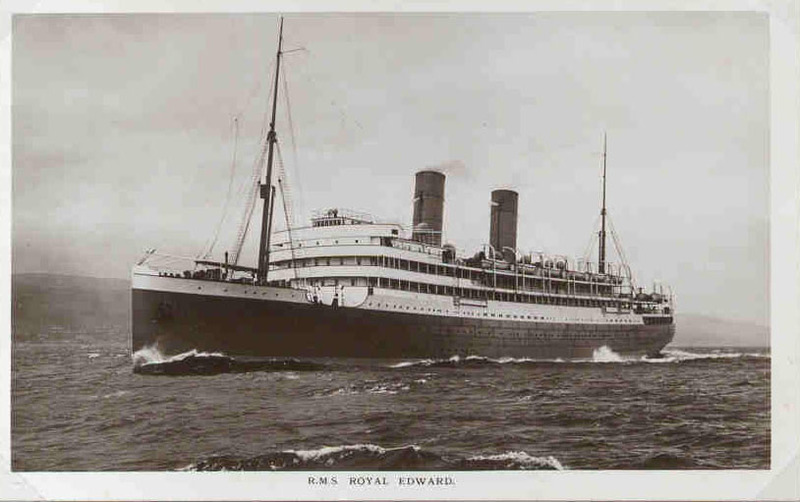 Three weeks ago the country was told of the sinking of the transport Royal Edward in the Aegean Sea, with a thousand of the men she carried. Even before the news of the disaster was published here, a memorial service was held over the spot where the ship went down, and the bodies of those who had lost their lives were solemnly committed to the keeping of the sea. "It is our hope," writes the chaplain, "that the thought that such a service was held may give some comfort to the bereaved at home." 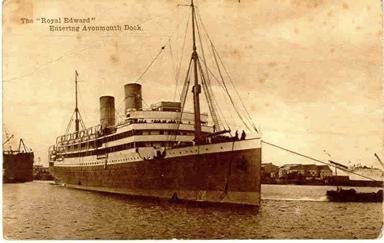 The Royal Edward was sunk a few minutes after 9 o'clock on the morning of Friday, August 13. 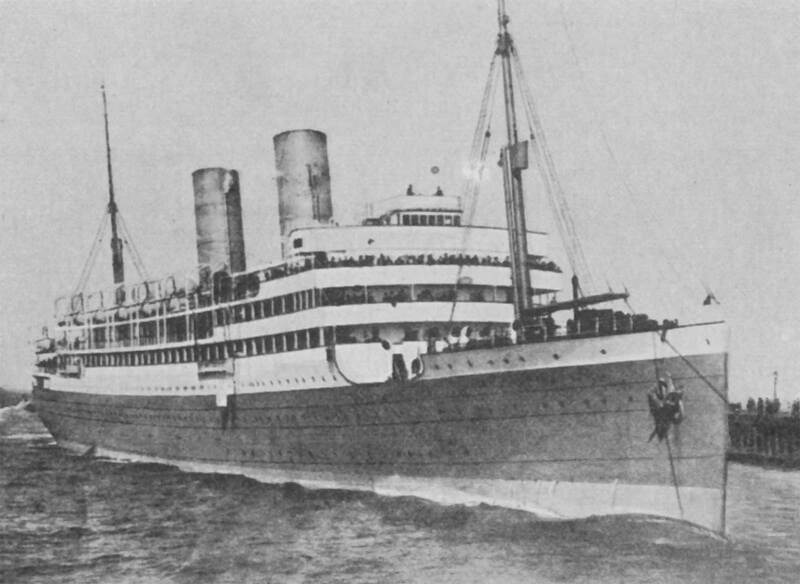 The news quickly reached Alexandria, where the hospital ship Devanha was getting ready to sail, and at the suggestion of the captain it was arranged that a memorial service should be held at the scene of the disaster. The Devanha left Alexandria, and on the following evening those on board knew that they were nearing the spot for lifeboats, lifebelts, soldiers' water bottles, planks, and other pieces of wreckage were seen floating on the water. Soon after half-past 8 they came close upon the place, and the ship's bell tolled slowly while the Europeans in the ship assembled on the boatdeck to pay the last tribute to the dead. 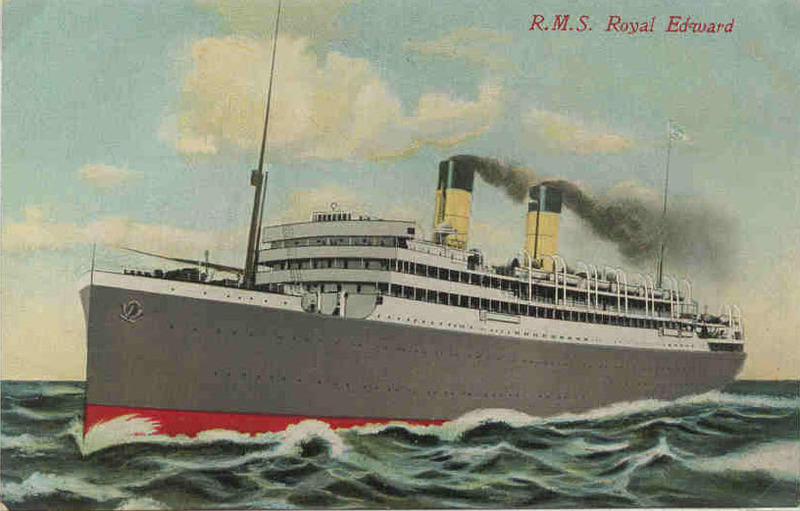 All were there - the captain, officers, engineers and stewards, the doctors, nurses, orderlies, and some of the men of the Royal Army Medical Corps who were passengers. The service began with the hymn "Let Saints on earth in concert sing." Then came the opening sentences of the Burial Service, followed by the 46th Psalm - "God is our help and strength." During the singing of the Psalm the vessel slowed down until it stopped right over the place where the Royal Edward lay. The lesson was read, and the committal prayer for those buried at sea followed. The collect for All Saints Day, the prayer for those in anxiety and sorrow, and the prayer for our soldiers and sailors were offered. Then, as the ship gradually proceeded on her way, the blessing was given, and the hymn "Now the labourer's task is o'er" was sung. The National Anthem and the Dead March in Saul brought the service to an end.